A Palestinian youth was shot and killed by Israeli live ammunition, on Thursday, east of the Al-Maghazi refugee camp in the central besieged Gaza Strip. Eyewitnesses said that Israeli forces opened fire towards a group of Palestinian youths, who had approached the electronic security fence separating the besieged Gaza Strip from Israel. Since the start of “The Great March of Return” protests on March 30, Israeli forces killed 220 Palestinians and injured more than 24,000 others, according to the ministry’s statistics. 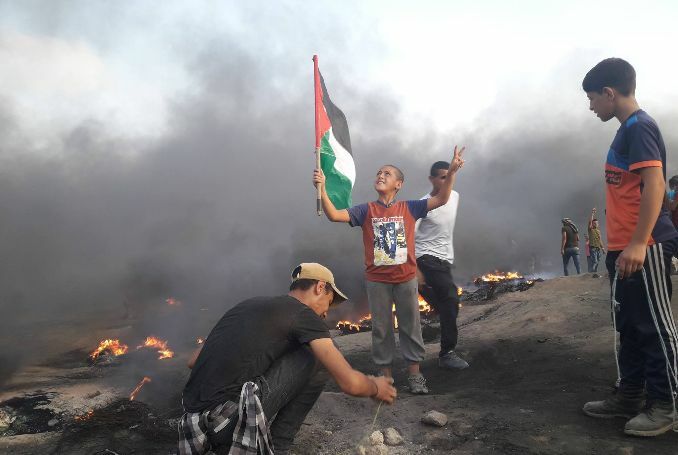 “The Great March of Return” protests were launched by thousands of Palestinian civilians in Gaza — which has suffered from a decade-long Israeli siege — who took to the borders to demand their right of return as refugees to their original homelands, now in present-day Israel. Be the first to comment on "Gaza: Israeli Forces Kill 21-Year-Old Palestinian #Palestine #GroupPalestine #israelTerrorists #boycottIsrael"